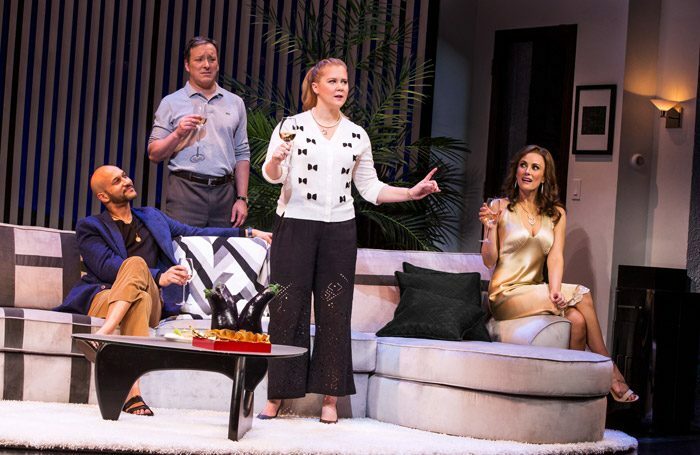 If nothing else, the world premiere of Steve Martin’s latest Broadway play Meteor Shower is testament to the power of celebrity: not just his own comedy credentials but those of his star, the comedian, writer and actor Amy Schumer. The show began performances with a record-breaking advance ticket sale of $7.5m, the biggest ever at Broadway’s Booth Theatre. Martin’s play is an experimental comedy that sometimes feels like an extended sketch show in which the same scenes are replayed again and again with different outcomes. The story is a little like that of Albee’s Who’s Afraid of Virginia Woolf? Set in 1990s California, it sees one married couple entertaining another at their swanky home. Instead of playing “get the guests”, as Martha and George do, the guests here seem on a mission to “get the hosts”, in more ways than one. The result is an occasionally brittle but seldom biting comedy, a not exactly subtle piece of writing about domestic relationships and the games people play with each other, given a cosmic edge by a spectacular meteor shower. Running for barely 80 minutes without an interval, the show feels paper-thin, but director Jerry Zaks keeps things bright and fast. Schumer has an appealingly perky comic stage presence and also capably conveys her character’s vulnerability. She is well supported by Jeremy Shamos as her husband, while Broadway musical regular Laura Benanti brings poise and a shimmering allure to the wife of the other couple and Keegan-Michael Key has a forceful belligerence as her husband.